Warfarin is a recognised high-risk drug for adverse events. Patients from rural and remote regions are at increased risk of these events because of problems of access to health care providers and services, and there is some reluctance to prescribe warfarin to patients in rural areas because of the difficulties in monitoring anticoagulated patients. The availability of portable international normalised ratio (INR) monitors is particularly attractive in rural or remote settings because of the lack of access to pathology services. Pharmacists and other health professionals in rural areas are ideally placed to assist general practitioners in the management of their anticoagulated patients through the use of portable INR monitors. 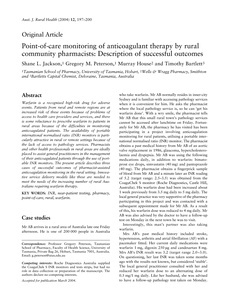 The present article describes three cases of successful outcomes of pharmacist-assisted anticoagulation monitoring in the rural setting. Innovative service delivery models like these are needed to meet the needs of the increasing number of rural Australians requiring warfarin therapy.